Available for the Royal Marines, Royal Navy, Merchant Navy, British Army and RAF. Ready tied and made of high quality polyester. 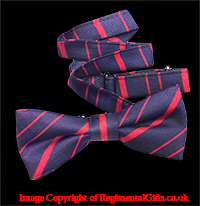 Superior quality Royal Engineers (Corps Of Royal Engineers) (RE) Regimental Colours Striped Bow Tie. This ready tied tie is made of high quality polyester. 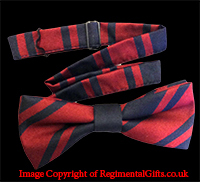 Superior quality Household Division Regimental Colours Striped Bow Tie. This ready tied tie is made of high quality polyester. Superior quality Royal Regiment of Scotland Regimental Colours Striped Bow Tie. This ready tied tie is made of high quality polyester. 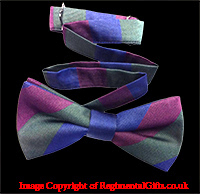 Superior quality The Princess Of Wales's Royal Regiment (PWRR) Regimental Colours Striped Bow Tie. This ready tied tie is made of high quality polyester. 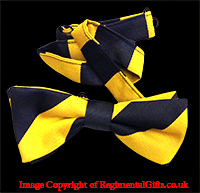 Superior quality The Queen's Regiment Regimental Colours Striped Bow Tie. This ready tied tie is made of high quality polyester. 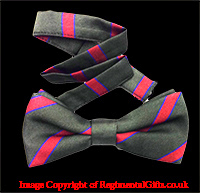 Superior quality The Royal Hampshire Regiment Regimental Colours Striped Bow Tie. This ready tied tie is made of high quality polyester. 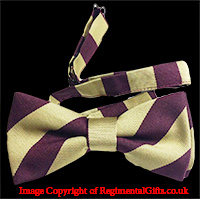 Superior quality The King's Regiment Regimental Colours Striped Bow Tie. This ready tied tie is made of high quality polyester. 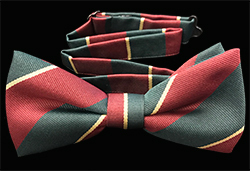 Superior quality The Mercians Regimental Colours Striped Bow Tie. This ready tied tie is made of high quality polyester. 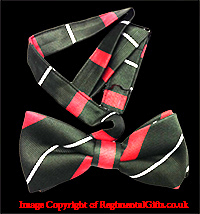 Superior quality The Worcestershire And Sherwood Foresters (WFRs) Regimental Colours Striped Bow Tie. This ready tied tie is made of high quality polyester. 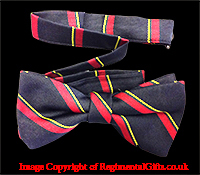 Superior quality The Worcestershire Regiment Regimental Colours Striped Bow Tie. This ready tied tie is made of high quality polyester. 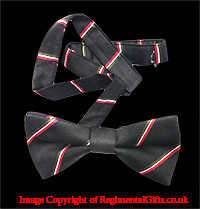 Superior quality The Royal Regiment Of Wales (RRW) Regimental Colours Striped Bow Tie. This ready tied tie is made of high quality polyester. 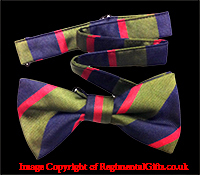 Superior quality The Royal Irish Regiment (RIR) Regimental Colours Striped Bow Tie. This ready tied tie is made of high quality polyester. 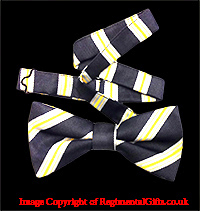 Superior quality The Rifles Regimental Colours Striped Bow Tie. This ready tied tie is made of high quality polyester. 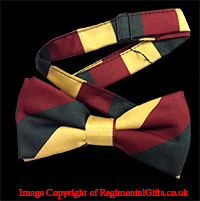 Superior quality The Devonshire & Dorset Regiment (D&D) Regimental Colours Striped Bow Tie. This ready tied tie is made of high quality polyester. 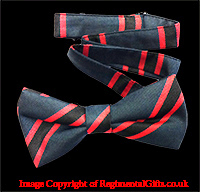 Superior quality The Light Infantry (LI) Regimental Colours Striped Bow Tie. This ready tied tie is made of high quality polyester. 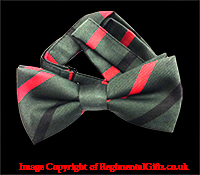 Superior quality The Royal Green Jackets (RGJ) Regimental Colours Striped Bow Tie. This ready tied tie is made of high quality polyester. 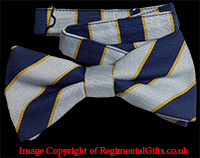 Superior quality Royal Pioneer Corps (RPC) Regimental Colours Striped Bow Tie. This ready tied tie is made of high quality polyester. 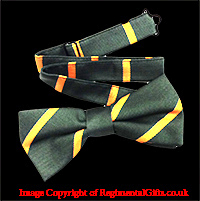 Superior quality Army Catering Corps (ACC) Regimental Colours Striped Bow Tie. This ready tied tie is made of high quality polyester. 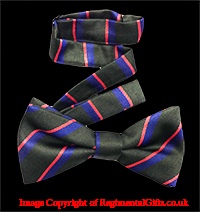 Superior quality Royal Military Police (RMP) Regimental Colours Striped Bow Tie. This ready tied tie is made of high quality polyester. 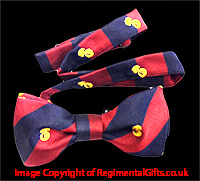 Superior quality Royal Army Dental Corps (RADC) Regimental Colours Striped Bow Tie. This ready tied tie is made of high quality polyester. 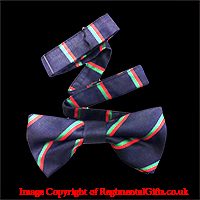 Superior quality Royal Marines (RM) Regimental Colours Striped Bow Tie. This ready tied tie is made of high quality polyester. 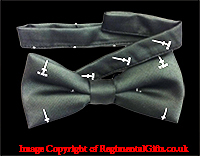 Superior quality 29 Commando Regiment Royal Artillery (Royal Regiment Of Artillery) (RA) Regimental Colours Motif Bow Tie. This ready tied tie is made of high quality polyester. 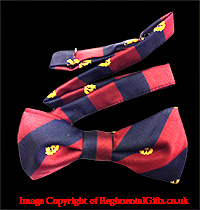 Superior quality 59 Independent Commando Squadron Royal Engineers (Corps Of Royal Engineers) (RE) Regimental Colours Motif Bow Tie. This ready tied tie is made of high quality polyester. Superior quality Grenadier Guards Regimental Colours Motif Bow Tie. This ready tied tie is made of high quality polyester. Superior quality Scots Guards Regimental Colours Motif Bow Tie. This ready tied tie is made of high quality polyester.